Three hundred miles off the Argentina coast in the south Atlantic lay the Falkland Islands, consisting of two main isles (East and West Falkland) and about two hundred smaller islands. The only town is also the capital of the region, Port Stanley, and it is from there that the British territories of South Georgia and South Sandwich Islands are administered. With a total population of only a couple thousand stalwart individuals (and many more sheep and livestock) the Falklands seems an odd place to fight a war over, but that's exactly what happened in 1982. Ownership of the islands has always been a hotly contested issue between the governments of Argentina and Great Britain. Argentina had claimed the islands since 1820, but the British actually occupied the islands from 1833 onwards. On March 26th, 1982 the Argentinean dictatorship of General Galtieri decided to invade the islands in an operation titled Operación Rosario, not for any true military objective, but simply to save his skin, and the other heavy handed rulers of Argentina. Civil unrest had been steadily growing, inflation was taking its toll on the economy (which was already in shambles), and if the people did not have an external enemy they would soon turn on the junta. Why not take what they had claimed was theirs for all those decades? On April 2nd the war began, with thousands of Argentine troops landing on the Falklands. Seventy-two days later the conflict was over. The British forces, which had been outnumbered from the start, had cobbled together an invasion force of leaky ships without adequate air cover to fight a war thousands of miles away from England over mostly empty rock. While sounding like a recipe for defeat the British forces triumphed easily over the Argentine forces, capturing 11,000 prisoners and suffering only a couple hundred casualties. Galtieri, whose raison d'être for the war was to insure his political survival, ultimately gave up the power he was trying to tenaciously cling to. Now ProSIM and Shrapnel Games gives you the chance to relive history. 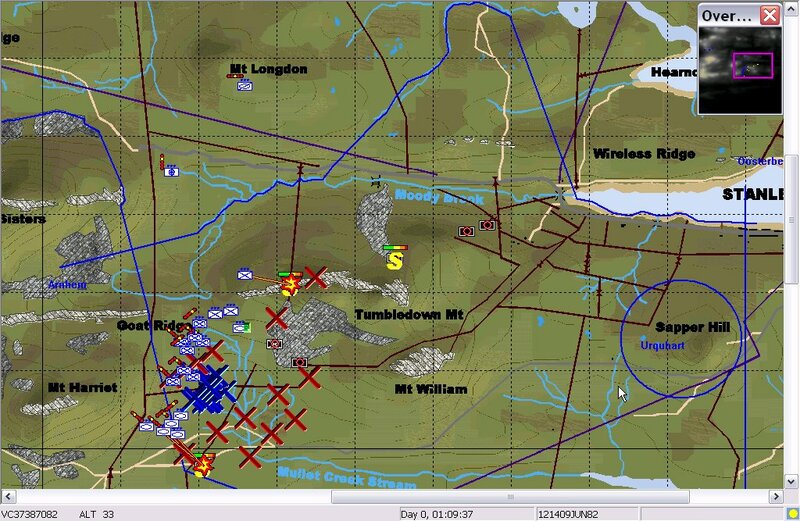 Using an enhanced version of the highly regarded ATF: Armored Task Force engine, The Falklands War: 1982 is the ultimate real-time simulation of the conflict. 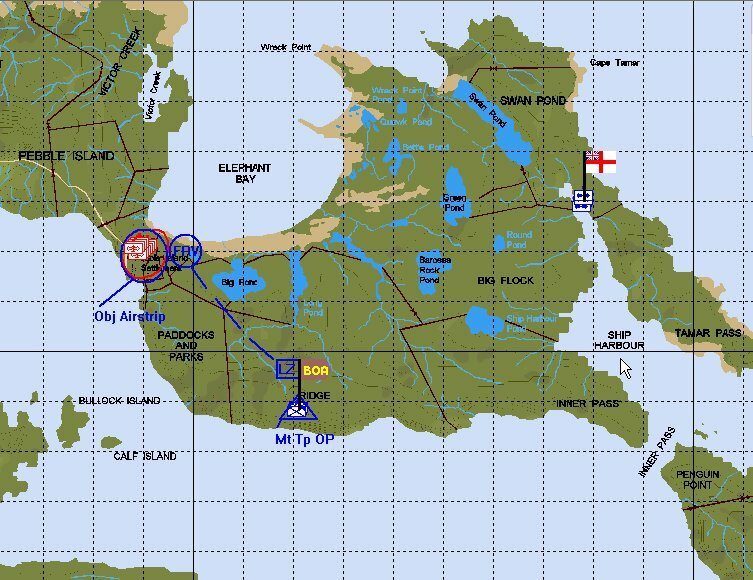 From playing on the actual topographical maps the British forces used of the island, to the intensely accurate statistics for weapon platforms, to informative scenarios that present the player with the same challenges faced by real-world commanders in 1982, The Falklands War: 1982 will have you smelling cordite and diesel. The human element has not been neglected either, with skill ratings for troops made up of ten different areas of expertise in military operations and a detailed light infantry combat resolution system down to bayonet attacks. The Falklands War: 1982 is what true wargaming is all about; you don't just play history, you learn history (and perhaps even change it). Are you ready for the challenge? "For all this though, The Falklands War: 1982 remains an extremely impressive product. One of the highest forms of praise that one can offer a wargame, on computer or cardboard, is to say that it makes sense. "...those who enjoy the thrill of complex, detailed military strategies will find a worthy title to add to their libraries." ♦ Uses an enhanced version of the ATF: Armored Task Force engine (also used in Raging Tiger: The Second Korean War), a military-grade simulation wrapped up in a civilian package. ♦ Challenging real-time gameplay, where split-second decisions can mean the choice between victory and defeat. ♦ Company to brigade sized units, with battalion level amphibious operations. ♦ Detailed scenario background information help players understand the scenario's place in the campaign, and sheds overall light on the history of the conflict. By game's end players will definitely win any trivia contests featuring the Falklands War! ♦ Fully historical campaign. Hypothetical situations are also presented, such as the use of armor by both forces or the British making an opposed landing. 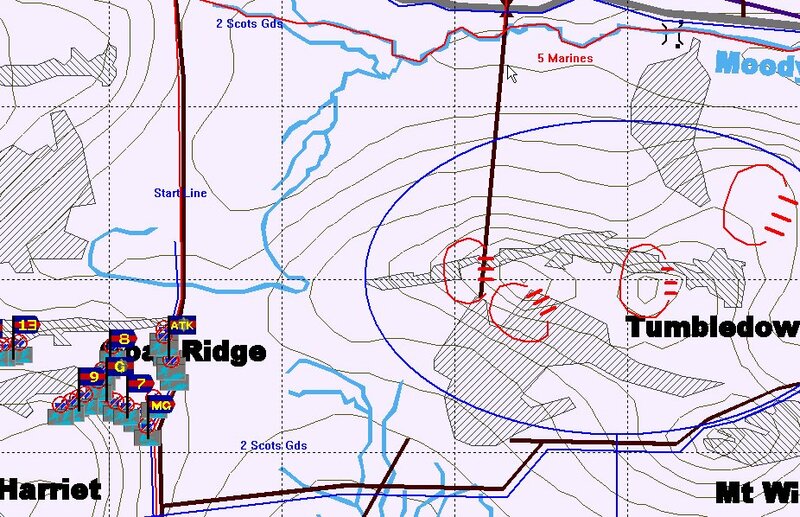 ♦ High resolution topographical maps of the battlefield (higher than any other ATF release). 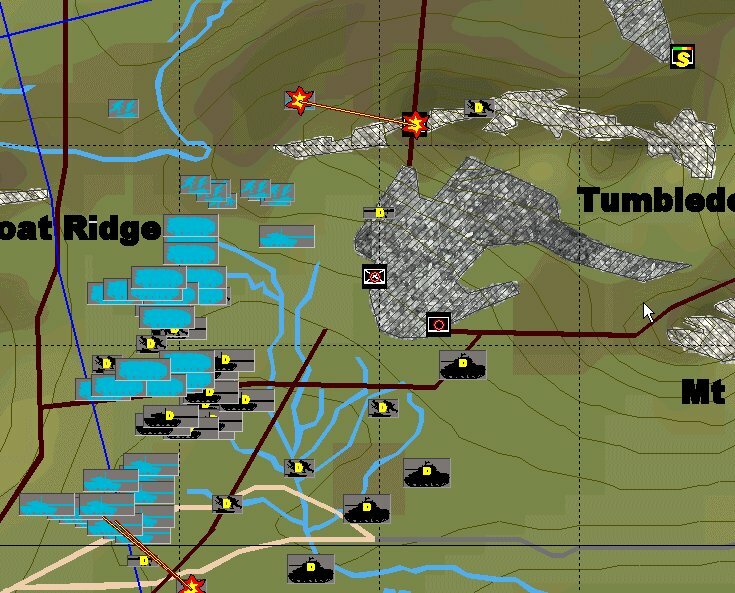 Because of the infantry-heavy nature of the conflict players will find the desire to play at higher zoom levels than they usually play an ATF game in, and with these new higher resolution maps terrain features and contour lines are easily discernable at upper zoom levels. ♦ Dynamic weather effects such as rain or fog that will hinder (or possibly help) operations. ♦ Ability to set unit quality skill levels before a scenario. Individual elements can be comprised of ten different skill levels in various military knowledge, allowing players to mimic a wide range of troop types. ♦ New GUI to maximize user input and assessment of how the battle is faring. ♦ Extensive database of the weapons used by the combatants, from small arms to naval vessels. Ultra-detailed statistics make the units fight like units do in reality, and not just a collection of hit points. ♦ Infantry combat receives a great deal of attention since the conflict was primarily one of infantry. Detail down to bayonet charges. ♦ Full backward compatibility with previous ATF engine based scenarios, including cross-multiplayer ability. "Thank you for this game. Please do more like this. Tell the developer that they have a new fan." "I thought, 'The Falklands War! Who gives a crap?' Then one night while babysitting my niece I downloaded and played the demo. I bought it the next day!" This demo includes two scenarios: a tutorial that covers a SAS raid on Pebble Island, and a regular scenario detailing a British attack on Argentinean defensive positions. 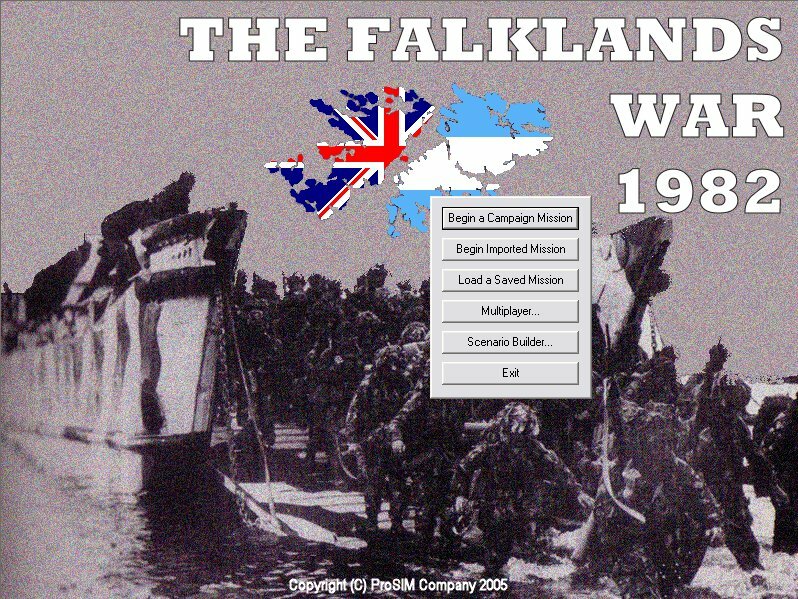 We hope you enjoy your The Falklands War: 1982 demo experience. Please contact customer service if you have any problems with the demo. 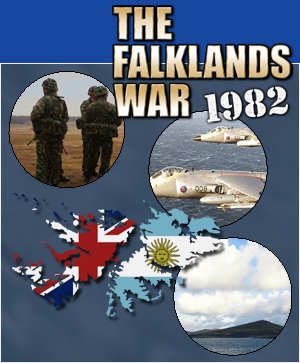 Register your copy of The Falklands War: 1982. The Falklands War: 1982 is published by Shrapnel Games, Inc.